BROOKLYN, NY – Americana band, Hollis Brown will headline the 2017 Synchrony Financial Rock ‘n’ Roll Brooklyn Half Marathon on Saturday, October 14, 2017. The band, named after a Bob Dylan song (“The Ballad of Hollis Brown”), will perform for thousands of runners and spectators at the finish line festival in Prospect Park. The race is back for its third year and will take runners on a tour of the famous New York City borough of Brooklyn. Each year, a local band has performed, and this year Hollis Brown will return to their home city to celebrate with runners. The band was founded by Mike Montali (singer and guitarist) and Jonathan Bonilla (guitarist) in New York City in 2009. Both 2nd-generation immigrants (Italian-American and Puerto Rican-American, respectively), they soon found their bandmates across America, recruiting Andrew Zehnal (drums), Adam Bock (keyboard/vocals), and Brian Courage (bass). Synchrony Financial Rock ‘n’ Roll Brooklyn will feature a full day of running with the half marathon and a new 5-mile run on Saturday, October 14, 2017. Both races will take place at 7:00 a.m. and follow the same start and same finish locations. The route begins in front of the Brooklyn Art Museum and winds through the tree-lined streets of Eastern Parkway, Washington Avenue and Ocean Avenue. In true Rock ‘n’ Roll fashion, entertainment, enthusiastic cheerleaders and spectators will line the race route. The race will conclude with a celebratory finish line festival and post race concert at the Nethermead in central Prospect Park, one of New York City’s most charming green spaces. The concert is free and open to the public. For more information, or to register online, please visit RunRocknRoll.com/Brooklyn or follow the hashtag #RnRBrooklyn. 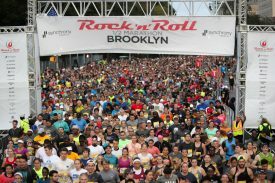 Synchrony Financial Rock ‘n’ Roll Brooklyn race will welcome more than 17,500 participants to Brooklyn on Saturday, October 14, 2017. The race returns for its third year and features live entertainment along the course, with a beer garden and concert at the finish line. A two-day Health & Fitness Expo kicks off event weekend at the Javits Convention Center on Thursday, October 12 and Friday, October 13. The free expo is open to the public and will feature the latest in running apparel and nutrition products. Saturday’s 5-mile race features a scenic course, which starts in front of the Brooklyn Art Museum and finishes at Prospect Park, while traveling past many of the borough’s famous landmarks and tree lines boulevards. Event weekend concludes with a finish line celebration and Toyota Rock ‘n’ Roll Concert Series. For more information about Rock ‘n’ Roll Brooklyn, watch this video, visit RunRocknRoll.com/Brooklyn and follow @RunRocknRoll on Twitter.